We discussed the issues describing People of Color by means of food in Part I of this guide, which brought rise to even more questions, mostly along the lines of “So, if food’s not an option, what can I use?” Well, I was just getting to that! This final portion focuses on describing skin tone, with photo and passage examples provided throughout. I hope to cover everything from the use of straight-forward description to the more creatively-inclined, keeping in mind the questions we’ve received on this topic. Pictured above: Black, Brown, Beige, White, Pink. This is a perfectly fine description that, while not providing the most detail, works well and will never become cliché. Describing characters’ skin as simply brown or beige works on its own, though it’s not particularly telling just from the range in brown alone. These are more rarely used words that actually “mean” their color. Some of these have multiple meanings, so you’ll want to look into those to determine what other associations a word might have. 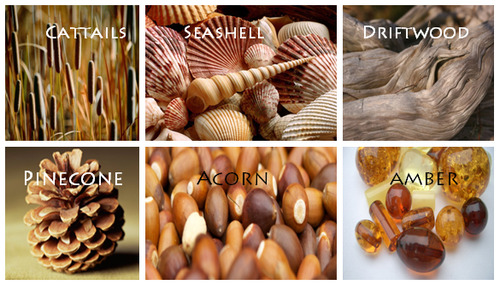 Pictured above: Umber, Sepia, Ochre, Russet, Terra-cotta, Gold, Tawny, Taupe, Khaki, Fawn. Complex colors work well alone, though often pair well with a basic color in regards to narrowing down shade/tone. As some of these are on the “rare” side, sliding in a definition of the word within the sentence itself may help readers who are unfamiliar with the term visualize the color without seeking a dictionary. Modifiers, often adjectives, make partial changes to a word.The following words are descriptors in reference to skin tone. If you’re looking to get more specific than “brown,” modifiers narrow down shade further. Keep in mind that these modifiers are not exactly colors. As an already brown-skinned person, I get tan from a lot of sun and resultingly become a darker, deeper brown. I turn a pale, more yellow-brown in the winter. While best used in combination with a color, I suppose words like “tan” “fair” and “light” do work alone; just note that tan is less likely to be taken for “naturally tan” and much more likely a tanned White person. Undertones are the colors beneath the skin, seeing as skin isn’t just one even color but has more subdued tones within the dominating palette. Mentioning the undertones within a character’s skin is an even more precise way to denote skin tone. 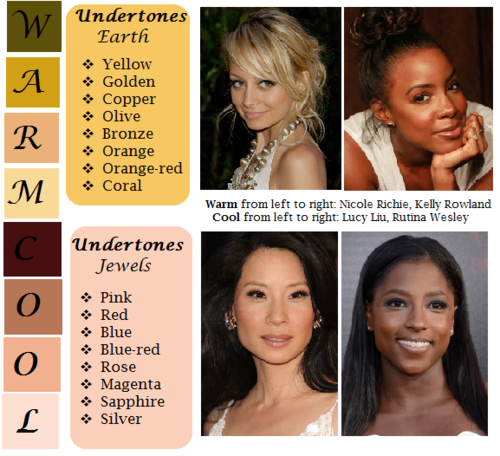 As shown, there’s a difference between say, brown skin with warm orange-red undertones (Kelly Rowland) and brown skin with cool, jewel undertones (Rutina Wesley). Here the state of skin also gives insight on character. Note my use of “fawn” in regards to multiple meaning and association. While fawn is a color, it’s also a small, timid deer, which describes this very traumatized character of mine perfectly. Though I use standard descriptions of skin tone more in my writing, at the same time I’m no stranger to creative descriptions, and do enjoy the occasional artsy detail of a character. Whether compared to night-cast rivers or day’s first light…I actually enjoy seeing Characters of Colors dressed in artful detail. I’ve read loads of descriptions in my day of white characters and their “smooth rose-tinged ivory skin”, while the PoC, if there, are reduced to something from a candy bowl or a Starbucks drink, so to actually read of PoC described in lavish detail can be somewhat of a treat. Still, be mindful when you get creative with your character descriptions. Too many frills can become purple-prose–like, so do what feels right for your writing when and where. Not every character or scene warrants a creative description, either. Especially if they’re not even a secondary character. Using a combination of color descriptions from standard to creative is probably a better method than straight creative. But again, do what’s good for your tale. 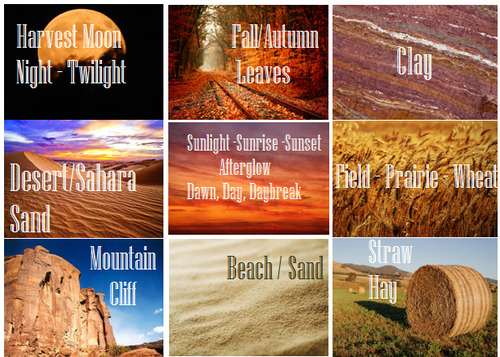 Pictured above: Harvest Moon -Twilight, Fall/Autumn Leaves, Clay, Desert/Sahara, Sunlight – Sunrise – Sunset – Afterglow – Dawn- Day- Daybreak, Field – Prairie – Wheat, Mountain/Cliff, Beach/Sand/Straw/Hay. Now before you run off to compare your heroine’s skin to the harvest moon or a cliff side, think about the associations to your words. When I think cliff, I think of jagged, perilous, rough. I hear sand and picture grainy, yet smooth. Calm. mellow. So consider your character and what you see fit to compare them to. Also consider whose perspective you’re describing them from. Someone describing a person they revere or admire may have a more pleasant, loftier description than someone who can’t stand the person. Even creative descriptions tend to draw help from your standard words. 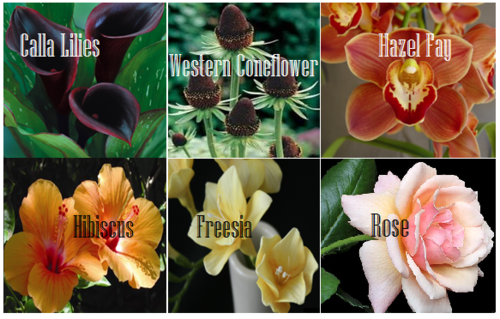 It was a bit difficult to find flowers to my liking that didn’t have a 20 character name or wasn’t called something like “chocolate silk” so these are the finalists. You’ll definitely want to avoid purple-prose here. Also be aware of flowers that most might’ve never heard of. Roses are easy, as most know the look and coloring(s) of this plant. But Western coneflowers? Calla lilies? Maybe not so much. These ones are kinda odd. Perhaps because I’ve never seen these in comparison to skin tone, With the exception of amber. I suggest reading out your sentences aloud to get a better feel of how it’ll sounds. I pictured some tree-dwelling being or person from a fantasy world in this example, which makes the comparison more appropriate. I don’t suggest using a comparison just “cuz you can” but actually being thoughtful about what you’re comparing your character to and how it applies to your character and/or setting. Wood can be an iffy description for skin tone. Not only due to several of them having “foody” terminology within their names, but again, associations. Some people would prefer not to compare/be compared to wood at all, so get opinions, try it aloud, and make sure it’s appropriate to the character if you do use it. I’ve even heard variations of these used before by comparison to an object of the same properties/coloring, such as penny for copper. These also work well with modifiers. These are trickier to use. As with some complex colors, the writer will have to get us to understand what most of these look like. If you use these, or any more rare description, consider if it actually “fits” the book or scene. Even if you’re able to get us to picture what “rutile” looks like, why are you using this description as opposed to something else? Have that answer for yourself. Physical character description can be more than skin tone. Show us hair, eyes, noses, mouth, hands…body posture, body shape, skin texture… though not necessarily all of those nor at once. Describing features also helps indicate race, especially if your character has some traits common within the race they are, such as afro hair to a Black character. Indicate Race Early: I suggest indicators of race be made at the earliest convenience within the writing, with more hints threaded throughout here and there. Get Creative On Your Own: Obviously, I couldn’t cover every proper color or comparison in which has been “approved” to use for your characters’ skin color, so it’s up to you to use discretion when seeking other ways and shades to describe skin tone. Skin Color May Not Be Enough: Describing skin tone isn’t always enough to indicate someone’s ethnicity. As timeless cases with readers equating brown to “dark white” or something, more indicators of race may be needed. Describe White characters and PoC Alike: You should describe the race and/or skin tone of your white characters just as you do your Characters of Color. If you don’t, you risk implying that White is the default human being and PoC are the “Other”). PSA: Don’t use “Colored.” Based on some asks we’ve received using this word, I’d like to say that unless you or your character is a racist grandmama from the 1960s, do not call People of Color “colored” please. Not Sure Where to Start? You really can’t go wrong using basic colors for your skin descriptions. It’s actually what many people prefer and works best for most writing. Personally, I tend to describe my characters using a combo of basic colors + modifiers, with mentions of undertones at times. I do like to veer into more creative descriptions on occasion. Want some alternatives to “skin” or “skin color”? Try: Appearance, blend, blush, cast, coloring, complexion, flush, glow, hue, overtone, palette, pigmentation, rinse, shade, sheen, spectrum, tinge, tint, tone, undertone, value, wash. I tried to be as comprehensive as possible with this guide, but if you have a question regarding describing skin color that hasn’t been answered within part I or II of this guide, or have more questions after reading this post, feel free to ask!